Kogod professor Sonya Grier (right) talks with colleagues at the 2017 Race in the Marketplace Forum. You decide to have a conference, and you invite a bunch of people you’ve never met. Will anyone show up? Despite this uncertainty, the 2017 Race in the Marketplace Forum at American University ended up being an unequivocal success. It was not only well-attended, but it led to a scholarly exchange of ideas that’s still vibrant nine months later. 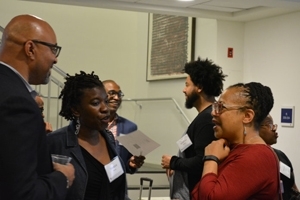 The event launched the Race in the Marketplace (RIM) Research Network, cofounded by Kogod School of Business professor Sonya Grier. As she explains in an interview, the growth of RIM has encouraged collaboration among a variety of disciplines in a too-often siloed field. RIM brings together scholars from anthropology, sociology, geography, marketing, and other areas. They worked together long distance, and Johnson is now a professor in France. They’re also both cofounders of RIM. The other RIM cofounder, Kevin Thomas of the University of Texas–Austin, was a student of current RIM advisory board member Gerri Henderson—and Henderson was once Grier’s classmate at Northwestern University. These kinds of conversations are continuing among RIM conference participants. For instance, AU assistant professor of health studies Elizabeth Cotter forged a research relationship with RIM advisory board member Naya Armendarez Jones. RIM is also editing a book, with chapter contributions from researchers on areas such as mortgages in the US, public health in Australia, discrimination in France, and stereotyping of Africa. At a more casual, but fruitful, level, RIM has a Facebook page where researchers share all kinds of news items and discussions. The Facebook feed has included: facial recognition and race; banks shutting their doors to home ownership; lack of Black Panther merchandise; and the Cleveland Indians’ move to abandon the “Chief Wahoo” logo. RIM has another major conference scheduled for June 2019 in Paris, and there will be plenty for RIM members to investigate in the coming years. With race and markets, areas of study are almost limitless. In recent years, the advertising industry had some well-publicized debacles: Kendall Jenner using Pepsi to end police brutality; Dove body wash magically turning a woman white; or the Dodge Ram truck-Martin Luther King connection nobody needed. Yet Grier says racial marketplace problems extend far beyond Madison Avenue. Even something as basic as faucet water in a public bathroom can be racially biased. Many of these difficulties can be attributed to having too few minority voices in the room, she notes. So even having a diverse group of researchers—such as RIM—can spur positive change.